﻿ Are caravan manufacturers getting interior design right? THIS POLL IS NOW CLOSED. WE’LL HAVE A NEW POLL FOR YOU SHORTLY. When buying a new caravan or motorhome, consumers have a number of choices to make: How many berths? Which model? Which manufacturer? One decision purchasers may not need to consider though, is how they want their new new model to look inside, and that’s because in most cases, it’s the manufacturer who makes decisions on interior design, upholstery, fixtures and fittings. Take the 2015 Swift Elegance tourer range (below) for example, its classic design uses a soft, caramel colour scheme and features clean and contemporary worktops throughout. The Bailey Approach Advance (below) range of motorhomes, however, are a little different. Inside, Bailey has introduced funky design elements, with splashes of bold colour and retro shapes. With these and so many more styles to choose from, we’re interested to find out if you think manufacturers are getting it right when it comes to interior design. Do you think manufacturers needed to give a wider range of factory supplied interior colour schemes on each model? Or perhaps you would prefer more of a blank canvas or neutral colour scheme to add style and colour to yourself? Cast your vote now using the options to the left and remember to explain your answer below. We’ll announce the results and publish some of our favourite comments right here on the blog next month. No it won’t be an Elddis or a Lunar had a new one of each both —- build quality. Took it in today for rear panel to be told they now just fit caps over the cracks instead of rectifying the design fault. As this can also happen to the top corners I will need to make regular checks. Interesting comments, we purchased a swift sprite 4 fb last year after years of motor homing, for the two of us this is ideal as we love the fixed bed like our last motor home, so problems, well yes i do sometimes wonder if manufacturers actually experience their products, every manufacturer seem to provide snippets of what we actually want such as enough power points, tv placing and please not next to the sink as some do, ( is that not dangerous) one thing i do miss in my swift is the electric hot plate on the stove as we caravanners/motorhomers pay for electric on site prefer when possible to use it. It’s a strange situation. The electric hot plate, external gas and electric points are available on Eccles and Eccles Sport (Europa as was), but not on Sprite, although they are all made at the same factory. We collected our new 2015 Swift Challenger 530 SE 19th March; regarding the interior we have noticed that all window handles are pointing down except for one, front seats bend down in the middle when sat on with locker doors open. Light switches by entrance door (outside light and interior) are the wrong way around. We have an Elddis Xplore 304. In the first year all the lights would not work as the fuse kept blowing, we took it back 3 times and eventually they found the wiring loom was tight through the body to outside light had chaffed through, and after less than 2 years we had water ingress in one window, all the tapes on the walls were curling up and coming loose. The covering inside of the cupboard doors was coming off and the shelf under the main window had to be replaced. The interior design of the living space is good with the L shaped seating as it gives somewhere for the dog so we do not trip over him. The lay out of the toilet and shower is very poor. The sink is far too large, as it intrudes in to the shower space too much. A sink that tipped up out of the way would be better. Fighting with a clinging shower curtain is not funny! Let me guess: your next won’t be an Elddis then? Likewise, mine won’t be a Rapido. I will probably go for a German one next time, they have high standards in their work ethic. Or are we expected to believe as a salesman told me recently: “with 40,000 components in a motorhome, some are bound to go wrong”. No matey, I do NOT expect a brand new item to be faulty when I buy it. If I buy 40,000 new items I do not expect them to be faulty. Sorry mate if I am being too picky. 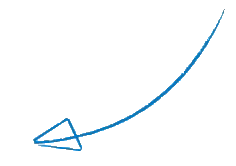 Once I was manufacturing items for a major car manufacturer who told me that one fault in 100,000 and they would hold the order process until it was remedied. One in 10,000 and the contract would be cancelled. You don’t see many faults in the base vehicle so why should you accept worse quality in the conversion part? What make is that, Charles? I haven’t had that, it sounds dreadful. Anyway the cure is to chuck their rubbish in the bin and go to your local carpet fitting shop, get some cut to shape and fitted. It will be a lot quicker, cheaper and better. The prices these manufacturers charge for extras is ridiculous. Hi Andrew, it’s an Elddis. It has now started to suffer from cracks appearing in the rear panel, this is a common fault over stressed abs instead of grp. It’s a pity that some extras like carpets fall apart when they get wet, not a realistic design when kids and dogs and us adults come back after a day out when rain started unexpectedly. To add insult to injury the replacement cost is stupid for the same poor quality. We tend to rally more than using registered sites, so we see more mud than many. Light colours are a real nightmare. The other design faul I find is unequal weight distribution. Gas bottles on A-Frame, water heater and battery box on offside near front, fridge & cooker midships (often) on nearside. Hardly any heavy items at the back. It’s really unbalanced – no wonder we see articles showing snaking effect on road. Why can’t the water heater and battery sit over the wheels on the offside to balance the kitchen? 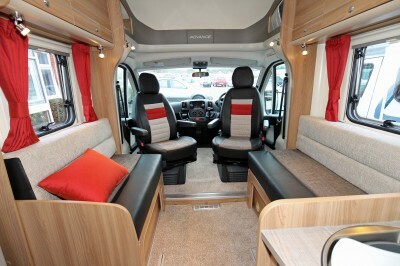 Just ordered new campervan and we are changing interior trim from standard offering in five shades! Dealer once told me that if manufacturers offered a motorhome/caravan with Tartan upholstery, no oven and no shower no one would buy it, yet most cover upholstery with rugs because of animals and don’t use oven or on-board shower! I recently bought a new motorhome. Our first priority was length, then layout and the interior design did not come into it at all. Firstly each manufacturer offers several interior trims and upholstery choices, secondly they don’t matter anyway. If you don’t like any of them, just go to a specialist upholstery company and spend £500-£1000 and get exactly what you want. That amount of money on top of the initial purchase price of £50,000 or more is small beans. You can change the upholstery, you cannot change the length or the furniture layout. 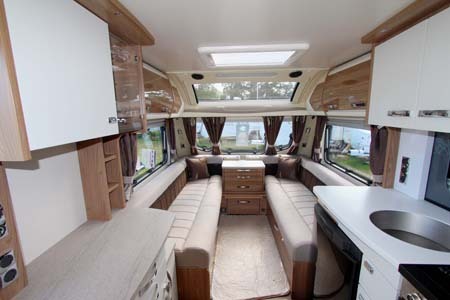 We’ve just purchased a Elddis Crusader Tempest for 4 people and a Greyhound. The layout is the main reason we bought it with the extra wide side dinette that make a reasonably sized double bed instead of the usual bunk affair. As for the colour scheme it’s quite neutral which allows splashes of colour to be added by yourselves. The carpets have been rolled up and took home as having a big dog makes sweeping hair up easy. The Walnut cabinets are also in the middle colour wise which I think will stand the test of time fashion wise. The dark wood bandwagon or indeed the plain whites will look dated by comparison in the next few years so depending on how long you intend to keep the new caravan should also be at the back of your mind when choosing. Ultimately though it’s the layout that makes a caravan work, the colour scheme is secondary and as for build quality I think there all the same these days. You’ll always have somebody prefering one manufacturer over another but as far as I can see there’s nothing in it. Hi Lucie, although not having recently bought a new camper van, our main thought was always ease of use. We have 3 dogs that always travel with us and so light colours are a no no. We use throws on all seating and have taken up all carpets to mats. With an end kitchen it enables people to move around the van without getting in the way of work taking place in the kitchen area. We have an autosleeper Orion zeta which suits us very well. We have just purchased a new Bailey cadiz and happy with the colour scheme apart from the very light colour of the carpets. We now have two options – either take them out or go and get new darker ones made that won’t show the marks as much. Thanks for getting in touch Roy. Naturally lighter carpets do tend to show signs of wear and tear more easily. You could try using doormats or rugs to prevent markings from appearing. Using throws on the upholstery could help to preserve fabrics too.